China and the USA are large markets that make sizeable investments in artificial intelligence. What are Europe’s strengths in this international competition? 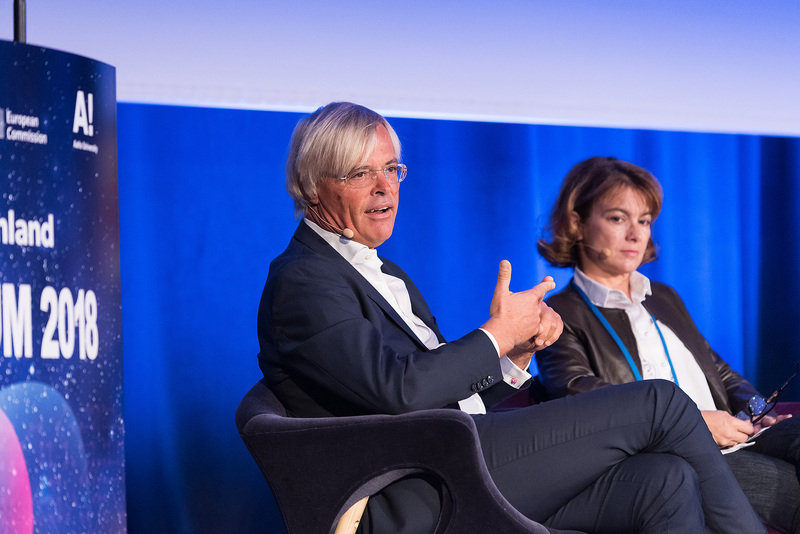 Panellists Jacques Bughin, Ilona Lundström, Mari-Noëlle Jégo-Laveissière, Antti Peltomäki and David Wallerstein explored this theme in their discussion at the AI Forum 2018 conference. 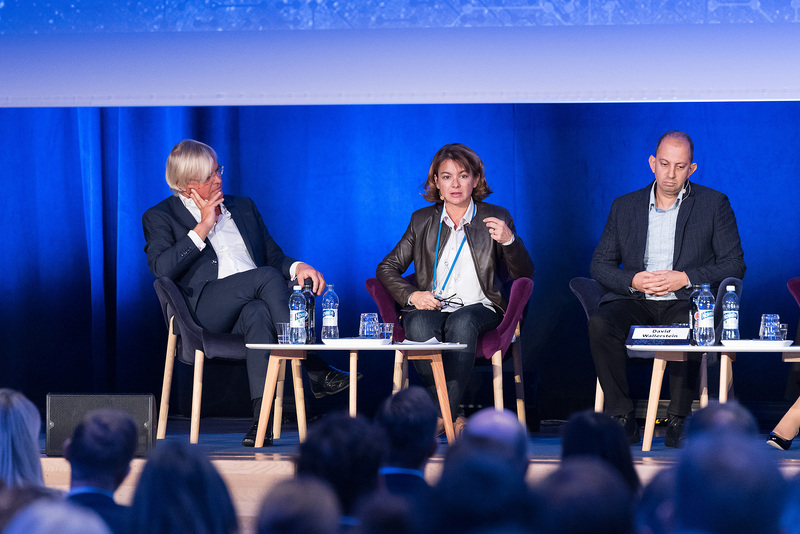 The panellists highlighted the role of artificial intelligence in creating a new business ecosystem and tackling humanity’s greatest challenges. That said, Europe is getting into the AI game at a relatively late stage. 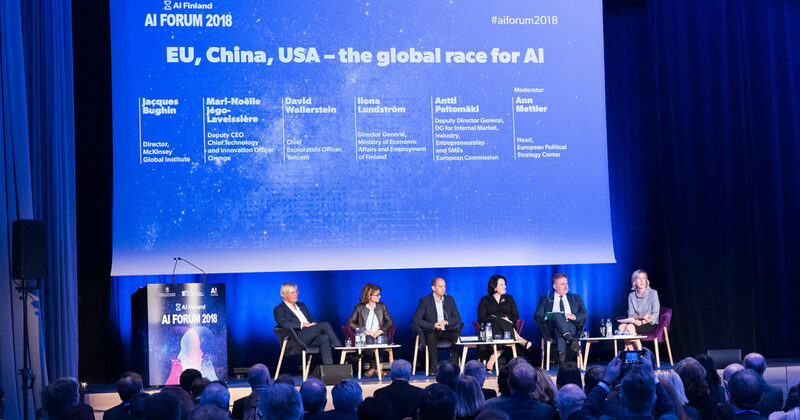 Panellists of the discussion “EU, China, USA – the global race for AI”. The panel discussion was led by Ann Mettler, Head of the European Political Strategy Centre. She commented that Europe is currently lagging behind in the adoption of artificial intelligence. According to Mettler, only 25 per cent of large companies and only 10 per cent of SMEs utilise the large data masses known as Big Data. “The challenge is related to the willingness of companies to adopt new technologies and change their old business models to fit with the environment of the future. Europe has been taking a step-by-step approach, but companies need to speed up and be more willing to take risks,” said Antti Peltomäki, Deputy Director-General of the European Commission’s Internal Market, Industry, Entrepreneurship and SMEs Directorate-General. 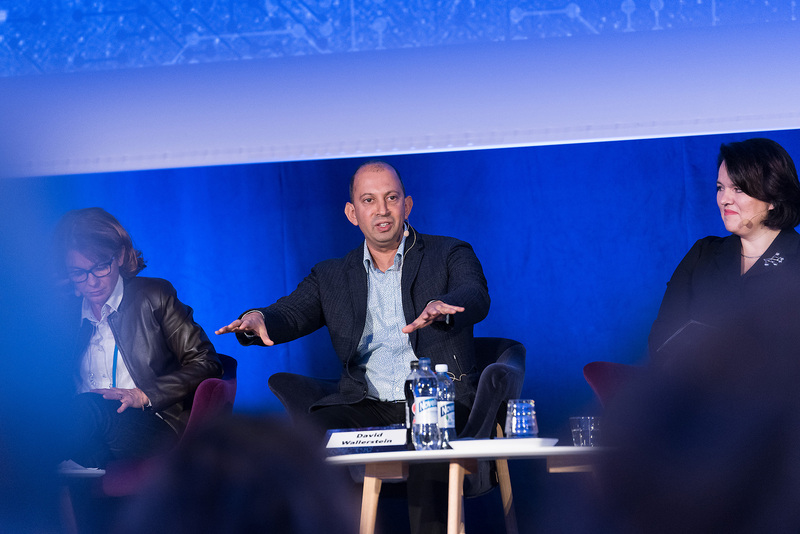 According to David Wallerstein, Chief Exploration Officer of internet industry company Tencent, AI technology in Europe needs to have a clear goal. Addressing the audience, he proposed that this goal could be improving people’s quality of life and protecting the ecosystem. “AI innovations need to meet the needs of citizens. Energy efficiency is an example of an area where we can take on a major challenge. Another goal could be to improve the efficiency of agriculture and food production or to advance people’s health. Taking these aspects into account will be essential for the competitiveness of businesses in the future,” Wallerstein explained. Mari-Noëlle Jégo-Laveissière, David Wallerstein and Ilona Lundström. The panellists discussed the fact that employees need new kinds of skills in the artificial intelligence era. Jacques Bughin, Director of the McKinsey Global Institute, commented that research reveals artificial intelligence to be a form of technology that can truly make a difference. “We have great potential, but a lot of work has to be done so that artificial intelligence can be applied more broadly in business operations. We need leadership, investment and increased skills,” Bughin explained. Jacques Bughin and Mari-Noëlle Jégo-Laveissière. According to Mari-Noëlle Jégo-Laveissière, Executive Vice President of Orange, artificial intelligence is creating a new business ecosystem and bringing better experiences to customers. She stressed the importance of training. “Our goal is to train 20,000 Orange employees in the use of AI. For example, we are training our designers and architects to help change the way they work and think,” Jégo-Laveissière explained. Jacques Bughin, Mari-Noëlle Jégo-Laveissière and David Wallerstein. Finland is working actively to advance the use of artificial intelligence: the national Artificial Intelligence Programme has been underway for a year already. Ilona Lundström, Director-General of the Ministry of Economic Affairs and Employment, highlighted Finland’s role as a testing laboratory for all of Europe. “We have two important lessons for the rest of Europe. The first one is that companies are very willing to invest in artificial intelligence. The second is that our government takes artificial intelligence very seriously. We need this attitude in Europe if we want to move forward,” says Lundström. David Wallerstein, Ilona Lundström and Antti Peltomäki. The panellists emphasised Europe’s transparency and courage to experiment with new things. According to Ann Mettler, Europe’s strength lies in trust and confidence. “If we don’t get into the game very quickly, we will not be involved in shaping this transformative general-purpose technology. We may not always be the fastest or the most innovative, but we do enjoy trust and confidence across Europe. This is something that can set us apart from others,” Mettler summed up. 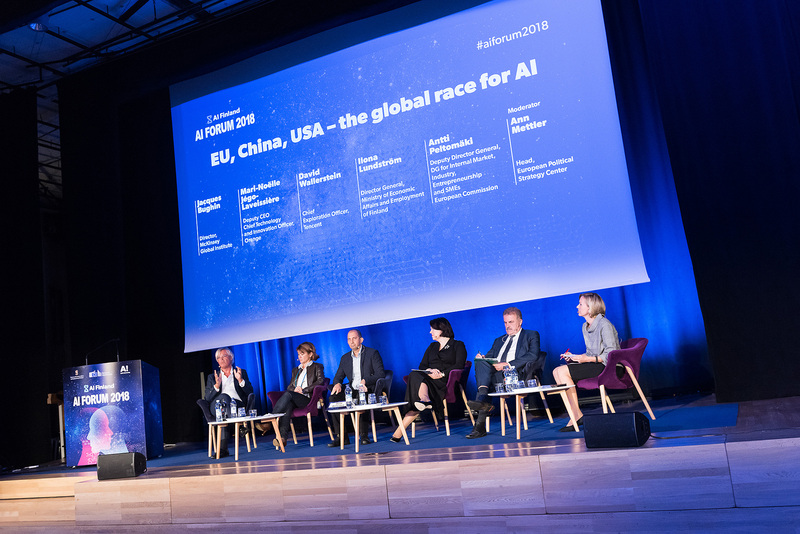 The AI Forum 2018 conference was held in Espoo, Finland on 8–9 October 2018. 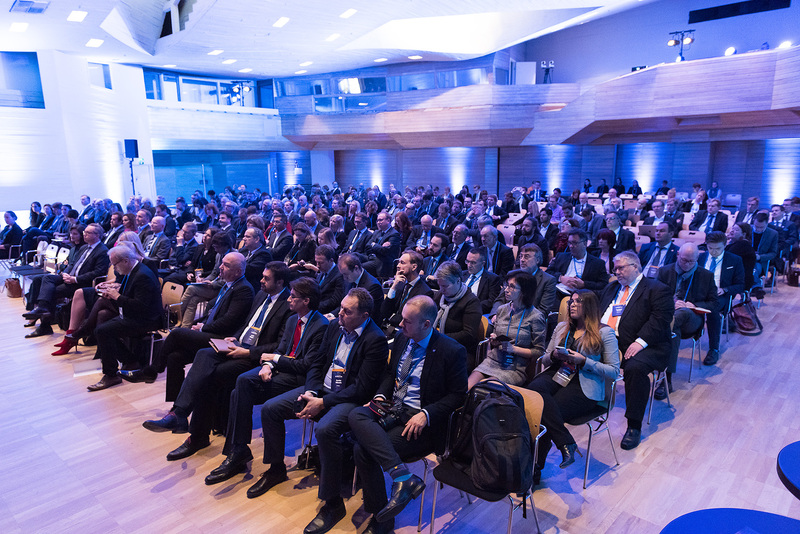 The conference brought together European ministers, business leaders and AI experts to discuss the future of AI in Europe. 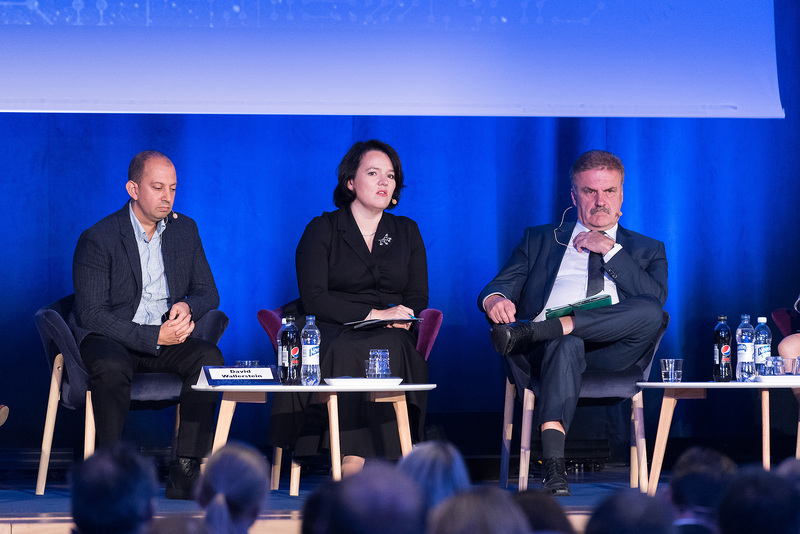 The conference was hosted by Finland’s Minister of Economic Affairs Mika Lintilä, Vice-President of the European Commission Jyrki Katainen and European Commissioner for Digital Economy and Society Mariya Gabriel. The invitation-only conference had around 250 attendees.